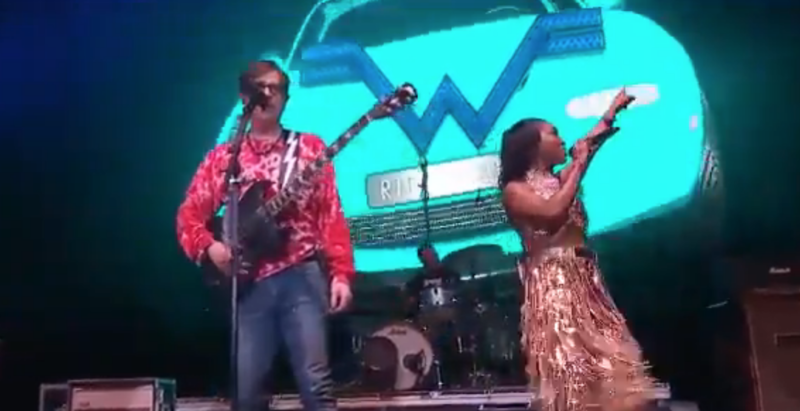 Weezer made their long overdue return to Coachella on Saturday, as they have played the festival for the first time in 14 years. Though their setlist leaned heavily on the greatest hits from the early part of their career, Rivers Cuomo and co.
To begin with, Weezer brought Tears For Their Fears for a collaborative performance of the band's New Wave hit, "Everybody Wants to Rule the World." Later, they were joined by TLC's Chilli for "No Scrubs." Weezer's latest cover of LP, The Teal Album which preceded the release of The Black Album a collection of new and original material. At Coachella, Weezer also performed a barbershop quartet version of their own song, Beverly Hills, as well as fan favorites including "Buddy Holly", "Hash Pipe" "," El Scorcho ", and" Island in the Sun ". Watch footage of their set below.